The Katrans helicopters were created for the Mistral-class amphibious assault ships commissioned by Russia from France. Photo: A Ka-52K "Katran" on the testing site at the Progress aviation plant. Ka-52K Katran attack helicopters will be sent to Syria on board the aircraft carrier “Admiral Kuznetsov” to be tested in action. According to military experts, this is being done to promote the new combat machine on the arms market. The Russian aircraft carrier Admiral Kuznetsov is getting ready for a voyage to the Syrian coast in the Mediterranean. The goal of the deployment is to check the combat capabilities of the ship and its strike group, including Russia's state-of-the-art KA-52K Katran helicopters. The cruiser's deck-based aircraft will join the Syrian campaign from October 2016 to January 2017. The deployment of the Admiral Kuznetsov amounts to a planned inspection of Russian arms, Viktor Murakhovsky, editor-in-chief of the Arsenal Otechestva (Arsenal of the Fatherland) magazine, told RBTH. "Sending the Admiral to Syria is a test of the operational and technical capacity and ability of our air carrier strike group, since previously Russia has never used air carriers in real combat conditions," said Murakhovsky. Currently, the vessel carries 15 Su-33 and MiG-29K/KUB fighter jets, as well as more than 10 Ka-52K, Ka-27 and Ka-31 helicopters. The main task of the air group will be to ensure the Russian Aerospace Forces' air defense and support the government troops in battles with militants opposed to Syrian leader Bashar al-Assad. “The air group's capacity to strike ground targets is limited," said Murakhovsky. "A new turning point in the war with militants should not be expected. The main role in the war against terrorists is being played by Assad's troops." Murakhovsky denied reports by some Russian media that the cruiser will be involved in combat earlier than planned in response to the killing of Russian pilots near the city of Palmyra. During the deployment of the Admiral Kuznetsov, Russia's state-of-the-art Ka-52K Katran helicopters – the ship-based version of the Ka-52, which is already being used in the Syrian operation – will be live-fire tested. 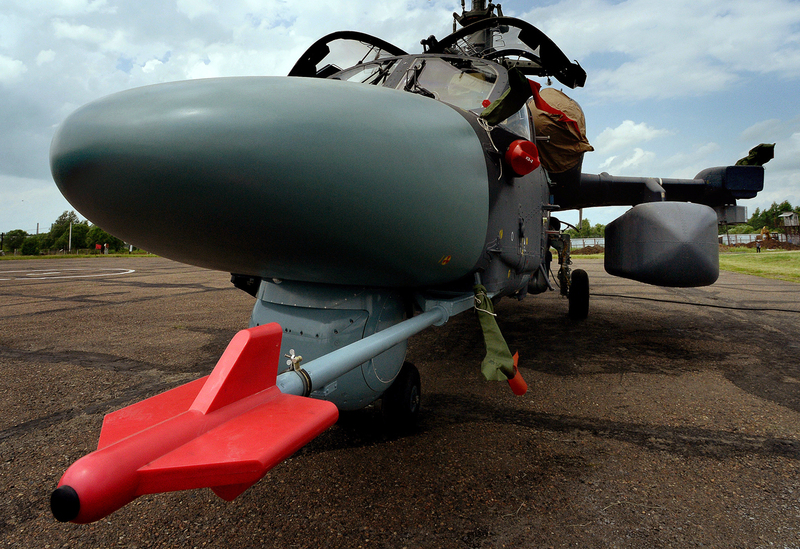 The land-based version of the combat machine was first used during the Russian air campaign in Syria. The first images of the combat use of the helicopter hit the internet on April 3, when the government army completely liberated the city of Al-Qaryatayn in Homs province with the support of the Russian air force. According to Murakhovsky, the combat capabilities of the ship-based version of the Ka-52 is in no way inferior to the land-based one. "The machines will have to also manifest themselves in the support of land forces," he said. "The main difference between the helicopters are operational. The Katran has folding blades, so that it can fit in a helicopter carrier's hangar, while the navigation system has been slightly upgraded to ensure flights over the sea, boarding and landing on the ship." The Katrans were created specifically for the Mistral-class amphibious assault ships commissioned by Russia from France as early as 2011. But because of Russia’s role in the Ukrainian crisis, the helicopter carriers failed to join the Russian Navy: French President François Hollande terminated the contract for the supply of the Mistrals. According to Vadim Kozyulin, a professor at the Academy of Military Sciences, France canceled the contract under pressure from its NATO allies. As a result, the ships were acquired instead by Egypt, and immediately after that Cairo bought a batch of 50 Russian Katrans from Moscow. According to Dmitry Safonov, military analyst for daily newspaper Izvestiya, the use of Katrans in Syria will be a step toward promoting the machine in the global arms market. "In particular, this is being done to demonstrate the combat capabilities of the machine to Egypt," said Safronov.